A physicist says his latest research may finally put to rest one of the most vexing theories about America’s natural history: that the giant fauna of the Ice Age — and the culture of humans who hunted them — were wiped out by a cosmic impact. Studies of rock samples from the Channel Islands of California to the creeks of Oklahoma have failed to turn up any evidence, he says, that supports what’s known as the Younger Dryas Impact Hypothesis. For a decade, the impact theory has posited that a period of sudden cooling that occurred around 12,900 years ago, known as the Younger Dryas event, was caused by a collision with Earth by a meteorite, comet, or some other celestial object. Experts don’t dispute that Younger Dryas cold snap actually happened. The most widely held theory is that it was caused by rapid melting of glaciers at the end of the Ice Age, which inundated the northern oceans with fresh water and created a sudden change in ocean currents and, therefore, climate patterns. 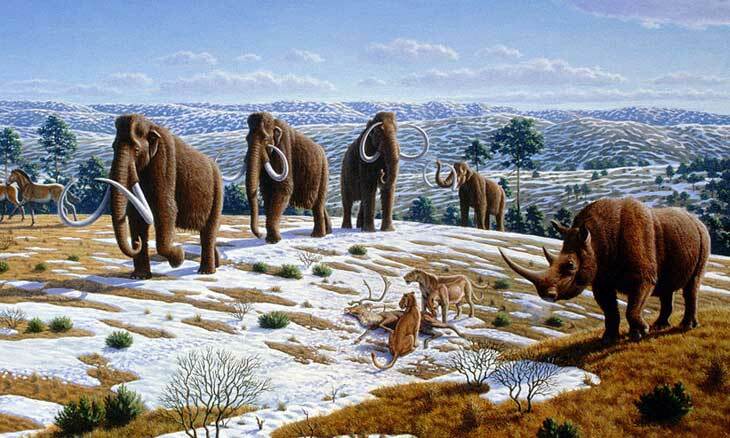 But proponents of the impact theory argue that a celestial impact triggered widespread wildfires and blanketed the atmosphere in dust, causing a collapse of ecosystems that led to the demise of such iconic animals as the mammoth and the mastodon, as well as the decline of the widespread Clovis culture. This, despite the lack of any obvious evidence of such a recent impact. But supporters of the impact hypothesis have long argued that proof can be found at a microscopic scale, in the form of nano-sized diamond crystals, produced by the energy of the space crash. But Daulton conducted a thorough analysis of samples that were found by other studies to have contained such diamonds. “My goal was to identify nanodiamonds,” Daulton said in an interview, “that is, confirm their presence, if present, and study them, if present. 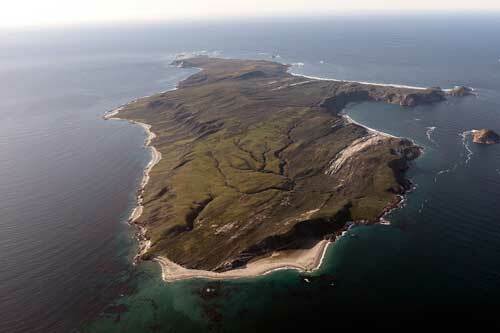 Some of the disputed evidence was found on Santa Rosa Island, one of the Channel Islands off the coast of southern California. The impetus for his study, he said, was a one-page article in the journal Science published in 2009 by Dr. Douglas Kennett of the University of Oregon, which reported the presence of nanodiamonds in a layer of rock that supporters of the impact theory call the Younger Dryas Boundary — a stratum that dates to 12,900 years ago. A reporter from Science, who was doing a write-up about the paper, contacted Daulton for comment, because Daulton was known for his study of formation of diamonds in space, such as during the formation of stars. Daulton decided to do his own research to test the claims made in Kennett’s paper and others. He began with the main deposit investigated by Kennett and his team, at Arlington Canyon, on Santa Rosa Island in California’s Channel Islands. “My coauthors have studied the Arlington Canyon site in great detail and have collected a large amount of data there,” Daulton said. Daulton and his colleagues collected tiny spheres of carbon from the Arlington site, ground them up, and then inspected them using transmission electron microscopy. “Despite my efforts, I was unable to locate any diamonds,” he said. Daulton added that the most of the “nanodiamond” evidence reported by impact proponents is not true diamond but rather is said to be hypothetical phases of carbon, called “n-diamonds” or “i-carbon,” whose very existence is controversial. “They are hypothetical phases,” he said. Daulton said that his observations of the tiny spheres from Santa Rosa Island may explain why they may have been misidentified. Rather than being made of pure carbon, the spheres turned out to contain small amounts of copper compounds, which can create the same patterns of scattered light and electrons — known as diffraction patterns — that have been attributed to the hypothetical carbon structures. identical to that ascribed to controversial ‘n-diamond’ and ‘i-carbon’, respectively,” Daulton said. Daulton also pointed out that a similar analysis of purported nanodiamonds from Oklahoma returned similar results. Daulton did not analyze those samples himself, but he summarized recent findings about them in his paper. In 2012, a team of scientists said it had found microscopic diamonds in Ice Age sediments from Bull Creek, Oklahoma — the highest concentration of such diamonds ever reported. But soon after, when a graduate student analyzed the same samples, she found no traces of diamonds at all. “We are not talking about a sample with a relatively marginal or small amount of nanodiamonds,” Daulton said. “We are talking about a sample with the greatest reported concentration of nanodiamonds of all Younger Dryas Boundary sites. “The recent Bull Creek data is very revealing,” he added. As a physicist whose work largely focuses on materials science and astronomy, Daulton has found himself drawn into one of the most heated debates in North American natural history. “At one point, I had never heard of the Younger Dryas,” he said. But given the lack of reproducible results that he’s found, he and his colleagues remain unpersuaded by the Younger Dryas Impact Hypothesis. “Studying science is very difficult, and they say, the devil is in the details,” he said. Daulton’s research appears in the Journal of Quaternary Science. Lack of evidence is not evidence that something did not happen. Would there be nano diamonds if the bolides hit the ice sheets that covered North America? How far from impacts site would nano diamonds be detected? Oklahoma not, Santa Rosa definitely not near the estimated trajectory. I understand that there is an black layer with higher iridium levels. More research is needed to determine if we should properly catalog bolide impact events. 1. NANODIAMONDS. The Daulton et al. paper makes it sound like there is no evidence for nanodiamonds at all, when in fact they admit to the opposite. 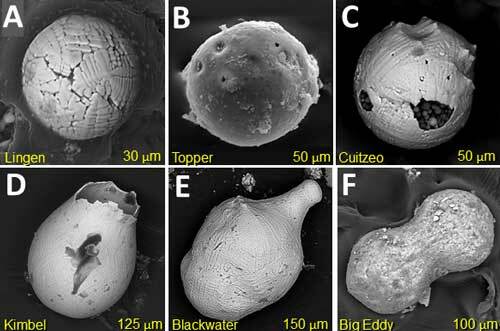 On page 22, they write, “While there is evidence of cubic nanodiamonds in Late Pleistocene sediments, their presence does not provide evidence of an impact because they have not been linked to impact processes.” The only way they can make that claim is to ignore all of the other evidence that we have such as high-temperature melted spherules and meltglass. LONSDALEITE. We wrote in Kinzie et al. (2014) that YDB “lonsdaleite-like” particles have all the characteristics of lonsdaleite, but there are too few of them for us to confirm that. We agree with Dalton that these particles are still debatable, and we agree that we misidentified some of them, but not all. PEAKS IN NANODIAMONDS. Daulton disputes that we have identified peaks in nanodiamonds, but frankly, that is just a nonsensical argument. While it is true that we cannot tell how many nanodiamonds are in the peaks, nevertheless, we know that there are qualitative peaks. Here’s a real world example of why Daulton is wrong. Let’s say that I look out the window onto a pond and I don’t see any ducks. Next day, I look out and there are lots of ducks. There are too many to count, but I know that there are a lot more than zero. The next day the ducks are gone. By definition, there was a peak in ducks on the previous day. The same applies to Daulton’s claim that we don’t have a peak in nanodiamonds. He is simply wrong – the peak has been confirmed by independent groups, including Bement et al. in Oklahoma and in Belgium by Tian et al., who are critics of the YDB hypothesis. NANODIAMONDS AND IMPACTS. Daulton and others keep repeating “Yes, the diamonds are there but that doesn’t prove there was an impact.” While that is true, technically, there is no other known way to have nanodiamonds appear in sediment except by an impact. To me, to use the same analogy as above, if they look like ducks, they probably are. 2. The Scott et al. paper looked for wildfire evidence in just one area, the Channel Islands in California. They found lots of charcoal and carbon spherules in many strata, and they state on page 11, “Carbonaceous materials from Arlington Canyon do not require extraterrestrial input or ignition, or in some cases preclude such an event,” in contradiction to their press release, which makes it seem like they have completely refuted the YDB hypothesis. Just to be clear, they’re saying that they can’t rule out an extraterrestrial impact. They also argue that the carbonaceous materials indicate low-temperature wildfires which, they assume, precludes extraterrestrial impacts. That assumption just shows their lack of knowledge of impact wildfires, such as those that occurred at Tunguska in 1908, where low-temperature wildfires were triggered beneath the fireball. At Tunguska, the highest temperatures were generated closest to the fireball, and temperatures dropped off exponentially with distance, meaning that at Tunguska and presumably, any other impact event, there are both high-and low-temperature fires. Thanks for letting me have my say, Blake. I hope you will read the Andronikov paper and note in your blog that there have been many such confirmations since 2007. Kind regards. “Despite the lack of evidence for the impact hypothesis”?? This is patently wrong. The evidence that is documented in the published literature grows every year. This is a poor article. lol, so does this square with more recent reports regarding platinum deposits at the boundary of the younger dryas? From my quick read last week, the platinum was not from earth, and was deposited around the world in a layer 12,900 years ago. Pretty conclusive evidence for some kind of impact. Sigh…..you guys never seem to give up, do you?! All of this intellectual ego, while it serves to act as a counter worth delving further, can get out of hand, just as the Luis and Walter Alveraz K-T Extinction Event, hotly denied by Officer C.B., et. al, was a true reputation killer. So now, we have to deny the same thinking with the possibility of a cosmic event almost thirteen thousand years ago. Just to be clear, here is the latest peer reviewed pair of papers, clearly demonstrating once again, that the overwhelming majority of catastrophic events on planet earth are the result of extra terrestrial input. “Extraordinary Biomass-Burning Episode and Impact Winter Triggered by the Younger Dryas Cosmic Impact ∼12,800 Years Ago. 1. Ice Cores and Glaciers”. Here’s the link: http://www.journals.uchicago.edu/doi/10.1086/695703 . Here’s a layman’s article detailing the same thing: “Research suggests toward end of Ice Age, humans witnessed fires larger than dinosaur killer, thanks to a cosmic impact. And here’s the link: https://phys.org/news/2018-02-ice-age-human-witnessed-larger.html . There is one reason why all this is So Important. And it has to do with Climate Change. And I’m not talking about human induced CO2, and global warming. I’m talking about global cooling and when the next glaciation is headed our way. 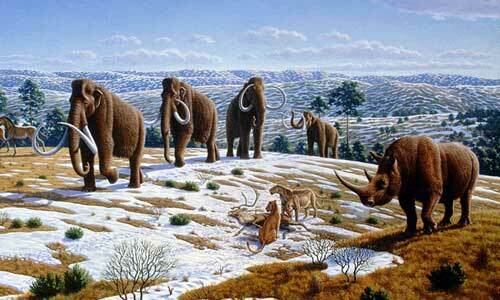 I’m not referring to the next ice age, because we have been in one(Pleistocene) for over 2.5 million years. Lake Vostok, and GISP2 studies show that interglacials last about 12,500 years, and the Younger Dryas Event extends out that far. This means we are overdue to begin sliding into the next glaciation, and nobody appears to be aware of this. We’re overdue! And its time the world got its act together and began preparing for it, or billions of humans will almost certainly starve to death. And that doesn’t even include the wars with which humanity will almost certainly inherit. We should all be terribly worried, because once again, the planet is about to be sent into another glaciation, thanks to our cosmic neighbors. This lowly physical anthropologist is greatly concerned.